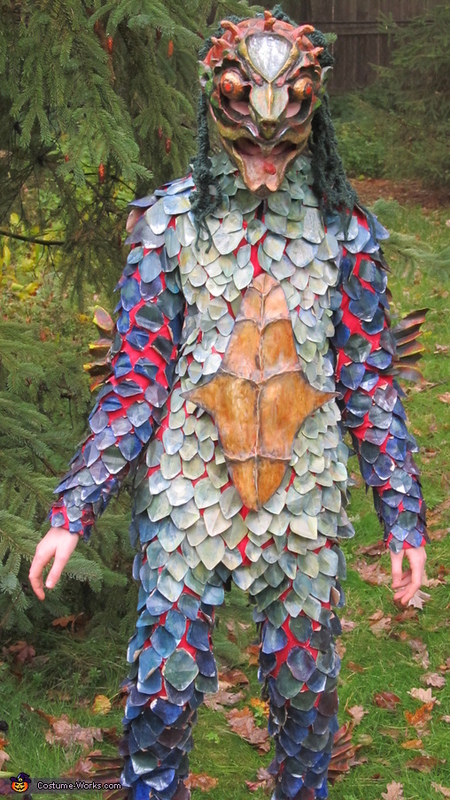 This is my 14-year old daughter wearing the kappa costume I made for her this Halloween. I’ve been making costumes for my daughter every year since she was 4 years old, based on whatever she wants to be. This year, she told me that she wanted to be a kappa. She is very interested in Asian culture, is currently learning Chinese, and loves all mythology. It seemed to me that a kappa would be the perfect idea for a homemade costume, because there is so much left to the artist’s interpretation in literature and art. A kappa is a mysterious and (usually) malevolent river creature described in Japanese folklore. Kappas are known to drown and consume wayward children who stray too far into the river’s current. There are varying interpretations of what a kappa looks like – some say their visage is derived from that of the nocturnal Japanese giant salamander, which is a large and formidable river-dwelling omnivore. It’s also described with similarities to a turtle, with the kappa’s sharp “beak” and shell, but with some facial features of an ape, and the stature of a man. Color may vary from green to blue to red. Hair is said to grow around a basin of mysterious fluid on the top of their heads, from which all their power is derived. As a river creature, they are said to be excellent swimmers, but prefer the murky depths like an alligator snapping turtle awaiting its prey. I wanted to conceive the costume to evoke peoples’ fear and awe of the natural world through the ages, with its half-told mysteries. For me, there is literature, art, oral history, and nature that surrounds us to draw inspiration from. The grotesque is beautiful, and some of the most inspiring art for me is a mixture of elements as interpreted by the artist. I read stories about kappas, looked through pictures of Japanese scroll paintings, Chinese dragon puppets, Japanese temple guardians, medieval Western European art, and of course, snapping turtles. I set about making the mask first, since it’s the heart and soul of the costume. First, I measured the contours of my daughter’s face to account for being able to see and breathe, and for the mask to fit correctly around her face and head. I sculpted the mask out of water-based clay, and then set the clay next to the dehumidifier in the basement to accelerate the drying time. After the clay was thoroughly dry, I applied Vaseline to the surface, and then applied layers of papier mache. I let each layer thoroughly dry before applying the next layer, so to lessen any distortion of the sculpture. Once all layers were dry, I removed the clay in sections. After ensuring that it fit my daughter’s face, I applied gesso to prep the surface, and then painted the mask. I hot-glued pieces of fabric inside the mask at pressure points for comfort, and around the perimeter in order to attach elastic bands so that the mask could be worn. I knit long sections of algae-like hair with random, short series of increases and decreases from dark green yarn, and sewed each one on to the back of the mask and then onto the elastic so that it would hang evenly on the head. While waiting at various stages of the mask drying, I started making the body of the costume. I used a red union suit as the base. I cut out each scale from more recycled brown paper grocery bags, and sewed each one onto the fabric. I arranged them as I went along from different sizes and shapes. Each scale was painted, and then folded in the center so as to not curl up too much. I drew the fins on more paper grocery bags, cut duplicates and glued them together, folding them in a roughly accordion fashion. I glued triangles of paper perpendicular to the fins at the base, and sewed them onto each of the arms and legs. For the shell (carapace on the back and plastron on the front) I took more measurements of my daughter. I sculpted the carapace from clay, with an eye toward the snapping turtle and the horseshoe crab. I used the same technique as described above for papier mache, gesso and paint. I drew the shape for the plastron from more brown paper, cut out two from this shape, pinched up the lines denoting the sections on one, glued the other on the back, and painted it. I glued fabric on the back, so that I would be able to sew one half of it onto the costume. The other side would be left unattached, except for a piece of Velcro which I used to keep it flat after my daughter put the body suit on and buttoned it in the front. The carapace on the back was heavy, and I knew it would pull the fabric down if I attached it directly. I had to rig a horizontal section of wire onto a collared fleece jacket worn underneath the costume, drill three holes into the top of the carapace, insert wires into each hole, and then twist each through the horizontal wire on the jacked. I cut off scraps of red fabric and fashioned a collar to cover the fleece, added scales to blend with the rest of the costume, and sewed it to the top. I spent about $30 on a 50 lb. box of clay, used about 10 lbs. of it, and spent another $25 for the red union suit. Grocery bags are easy to come by and free, and I already had glue, flour, wire, and sewing materials. Total cost was $55, but I’ll be able to use the rest of the clay for other projects. This was an enjoyable and engaging project for me, and a lot of people seemed to really love the costume. Did you paint the scales before or after you attached them?